In the daily routine, people are required to shop for different items. But every time buying the branded products at the original rates, puts heavy burden on pockets. In order to stay in your budget, you can utilize other efficient options to shop the required stuff. Discount offers, wholesale prices, clearance and sales offers are among such options, offering you a smarter way to get your favorites at low prices. Retailer refuses large quantity of items to be placed in store due to the minute packaging mistakes. Store orders a huge amount of 100,000 items, but cancel the last 25,000. If a retailer is unable to meet the sales goal forecast. Such closeouts or clearance can be used to promote the brand in the form of free gifts, featured items, fantastic bargains etc. Provides you a way to earn high profit margins. Provides a way to keep in touch with your customers. Offers updated and frech inventory to supplement the core products. 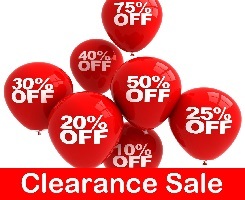 Clearance sales are awesome as products are offered at throw away prices. But the list of problems in the clearance sale is sizes, colours & sometimes even cut sizes. Have shopping many a times & lucky some of the products were good but a large number of products had something or the other in fault. For people who have big sizes like shoes of size 10 Indian & XXL clothing & even S size clothing it’s like a loot offer for them. I feel its worth shopping at such times, as we get the maximum savings. But clearance sales are like jackpots, if you get what you want then you have hit the jackpot, as most of the times we are unable to shop due to sizes & colors out of stock restrictions. A small tip try to buy as quickly as possible from clearance sales or any other sales as products gets SOLD OUT too quickly.